RV’s and tailgating make the perfect combination. Celebrating in the parking lot with your fellow sports fans has become a college football game rite of passage. But you can adapt the fun to any type of sporting event or festival you can imagine. While the pastime has been around for years, it is rapidly increasing in popularity. RV’s lend themselves superbly to this activity because your kitchen and bathroom are right on board. Many RV’s even have built-in outdoor grills. There is no better time than now to build a new tradition. Read on for some practical tips and techniques to make your next parking lot party a success. Marinate your meats and shape your burger patties the night before the party. Cut and store all your burger toppings in advance. The same goes for raw veggies. Potato salad and pasta salad are tailgating favorites that can be made ahead and served at mealtime. Try our Pesto Pasta Salad for a new spin on a classic. Chili or hearty soups can be made and served right from your slow cooker and are perfect for cooler days. Don’t forget a themed dessert. Cakes, cookies or cupcakes decorated with your teams’ colors are an old favorite. You can get creative by looking at sites like Pinterest. You can search for any sports team themed desserts. We typed in “Miami Hurricane Desserts” and got pages of great ideas. Have plenty of drink selections on hand to make sure your home team stays hydrated. Our Spicy Lemonade is a great option as it is a concentrate that can be mixed per glass as needed. If your family and friends are down for it, a potluck is a great idea too. Assigning each person or family to make a portion of the meal will ensure that everyone can enjoy themselves. It’s less expensive than preparing a whole meal yourself, and besides, sharing is fun! A small, easy to pitch pop up tent will give kids a fun place to play and hang out during the party. Designate a cooler filled with water, juice and other drinks just for the kids. Bring along some activities for the whole family to enjoy, like temporary tattoos, glow sticks, or water balloons. In case of rain, some indoor activities like board games or easy craft projects will keep kids busy. One of the perks you enjoy when you are tailgating with an RV is all the storage you have. You can pack it ahead of time with everything you need for the big day. If you visit multiple venues while tailgating, you can keep the decorations and supplies for each place in clear or labeled bins. Then, next time you attend the game, you can pull out your team’s container and get the party ready in a snap. If all of the preparation for one game seems to be a lot of work, consider extending your getaway for a few days. 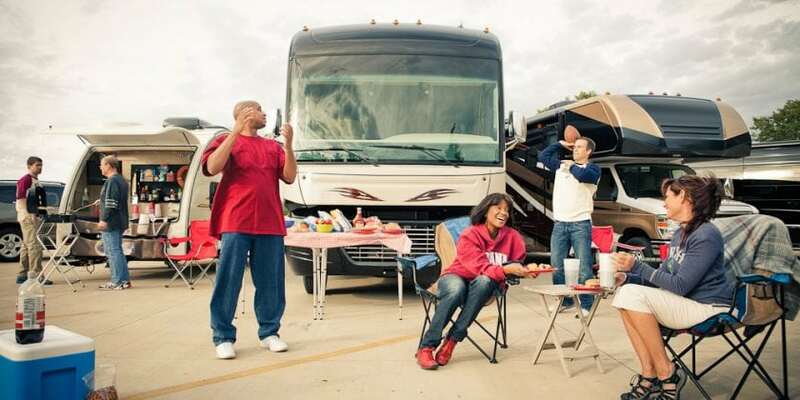 Most stadiums have several RV camping parks close by so you can plan a whole trip around your tailgating event. There are plenty of campgrounds and RV resorts near Camping World Bowl in Miami, and a quick google search for campgrounds near Champion Stadium in Kissimmee reveal several pages of results. Make sure to call ahead however as spots fill up quickly on game days. No matter where you decide to go tailgating in your RV, make sure that everyone has a fun, safe, and relaxing time by being aware of your surroundings and knowing the policies. Stadiums all have a tailgating rules page so make sure to check it out well in advance of the big day!